Jayne Wharf and Garry Smith are editors of Conflict Manager magazine and directors of the Conflict Research Group International. We are both senior instructors in Ju Jitsu, Jayne is currently training in preparation for the 3rd dan grading and Garry his 4th Dan. We both teach realistic self defence but from very different positions, literally. Jayne stands 5’2½” tall and Garry is 5’9”, she weighs 8st, he just under 15st. We regularly grapple, spar, brawl and ground-fight together and with others, it is what we like to do, but mostly we train and teach together. Difference in size due to dimorphism matters, we need to take it into account when we train. Sexual dimorphism is the condition where the two sexes of the same species exhibit different characteristics beyond the differences in their sexual organs. Size, muscle mass etc. Both of which will influence the outcome of a violent conflict. Recently we have see certain ground-fighting techniques, pretty technical ones, being promoted as good self defence for women. They are not, they are unrealistic, easy to counter and will not work against a committed attacker who knows what they are doing. We know, we train this all the time. When we were doing a demo for our juniors last week, I thought we were just showing a few moves nice and steady, so it was a big surprise when Jayne came at me like a hell-cat. It took me a good minute but I eventually got on top of her and pinned her. We were both red faced and puffing and panting. We did it again a few days later for a different group of juniors, similar outcome but this time she got her guard in so tight on my ribs I involuntary farted, I quickly tried to blame Jayne but the kids knew it was me. Red faced again. So in light of seeing BS techniques peddled as good SD, and what we do when we train, we decided to have the following conversation. 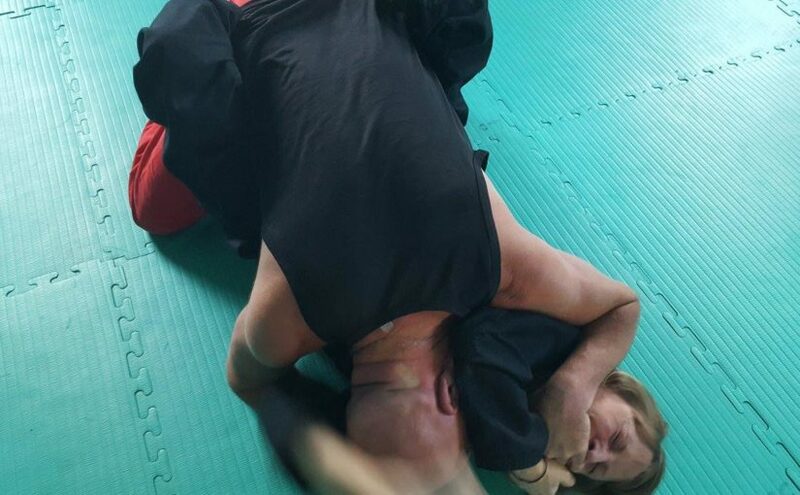 In our training session last Monday we had a short, but intense, ground-fight on the mat. The purpose was, if I remember rightly, for you to show the juniors that you need to fight aggressively against a bigger stronger opponent, not that you warned me. We have trained together for some time now, given the imbalance in size and weight why do you keep doing this? JW: You’d like me to say it’s because I like it … haha. The purpose on Monday was as you say to show the juniors that no matter if you’re the underdog (in particular the girls) you still have a chance if you have heart. Your brain may well be telling you you can’t win, but you have to push that aside and at least try, don’t give in before it all kicks off. Why do I keep doing it? For me personally it’s extremely rewarding. I get an opportunity to test what does & doesn’t work on someone who is bigger, stronger (dare I say it without offending you?) heavier than I am. I’m taking about the ‘cheats’ here because there is no way I would win if I played ‘fair’, so I don’t. I have to use my whole body to create the tiniest amount of movement, but with every small adjustment I may be gaining a long term advantage. I can promise you by the end I am absolutely exhausted, but this is the second reward, with each bout I not only gain information I also improve in fitness and strength. GS: As I said earlier I am almost twice your weight, No offence at all, it is as it is. OK so each fight allows you to ‘probe’ more is that fair? JW: Yes, no two bouts are the same. I always have to push aside the ‘I’m going to lose mentality at the start. I pretty much take it a stage at a time pulling on what worked last time where I can. I don’t forget the stuff that didn’t work, I will have thought about ‘why’ these didn’t work probably on a dog walk. If I have a possible ‘solution’ I may try that. I can’t plan ahead as such but I can prepare. Sometimes I have ‘something’ in mind that I want to try & I will attempt to manoeuvrer my way into it. I do listen to my mentors & will always try out their suggestions even if initially I think it’s not appropriate for me; I’ve been proven wrong many times…so again another lesson – don’t assume you know better…that’s good coming from someone who as you know knows everything … hahaha. GS: OK so what is it like fighting as a small woman against a nasty violent bigger man? you, you’re not the ‘nasty violent bigger man’. I met the nasty violent bigger man years gone by & I promise you I would annihilate the chap I have in mind if I were to meet him today. So for me all the training over the past few years is working for me. Fighting against you & the other fellas in the club is rewarding….smelly, sweaty, exhausting, but rewarding. GS:that is good to know. The thing is we know we train within safe parameters. We cannot bite, gouge etc. We do dirty fighting drills but I struggle as a man who would just go brute punching, to use such tactics, how can we do these things, should we? JW: I personally have no desire to inflict injury on others or myself in the name of self defence, so I would say ‘no, we shouldn’t’. As a club we already go way further many other as you know & I am happy with that level. If you want to encourage women to learn (as I think we should) then that’s not the way to go, we don’t want to frighten them away before they even try. I have also seen that for those who want to go that extra mile likewise we will make it happen; I’m thinking of you & Johnny here. GS: Well you surprise me a little here, You are quite aggressive in your application of technique in Ju Jitsu and very aggressive in our Self Defence training to the extent that I am incredibly proud of you if that is not patronising. For the reader Johnny and I have both had more than a few street/pub fights (with others) and we like to go for it a bit when we glove up. JW: What can I say is I like to show heart. I’m in training for my 3rd Dan and know that I need to exhibit the techniques above the expected standard…that and perhaps I just like to occasionally inflict some pain on yourself & Lee, John…well all of your really. GS: I think you do that and achieve a gold standard, to be honest there are times your face looks like you want to kill. Now do not play that down. Most women cannot do that. Sometimes I look up after you throw me and you are raining in punches and knees etc., all pulled of course, and it is scary. What are you thinking when you do this? JW: Honestly? Not much other than … it’s hard to put into words. There’s a mixture of as a trained Ju Jitsuka wanting to show a fantastic ‘finish’, as a coach wanting the students to see how ‘we’ want them to exhibit a technique and then …this is where I go dark…. What I want to do to past & any potential attackers. GS: That is interesting, as instructors we demonstrate technique after technique, Recently we have been showing people full mount, side mount etc. as part of our ground work. When we demo fights it is fun and you come at me full on. As you said I think that is excellent for the kids, especially the girls to see. WE want them to cheat, how do you feel about videos that show complicated technical chokes? JW: First things first, I ain’t full on (haha) I go the extra mile but I have more in the tank trust me. Videos showing complicated technical chokes…it depends on who’s showing them, also the accessibility and target audience. These should not be out in the general public domain. They need governance. GS: LOL so that is typical of you, not full on, well that will be sorted where you can go full on, I love fighting Johnny, I love fighting anyone in sporting fashion or for real, I love fighting you because you really go for it, so full on next time then. Thing is when we talked the other night you mentioned lack of feedback which I think was a fair criticism. Please explain to the reader what would help. For example whilst ground fighting the other night you used your knuckles in my left ribs, just digging them in on the blind-side. I can tolerate that but if you did it harder maybe it would shift me. JW: Yes, so I guess the point is just that. If I ‘try’ something I am always (I know you don’t believe this) conscious of not going over the top. Look I grew up with two hairy arsed brothers who took great delight on one hand being my protectors (and still do) then on the other tormenting me & hanging my upside down by one leg over the bannisters. So I’m heavy handed. What is helpful to me is to work out when & how I do need to push a bit further, make my response / counter stronger to have an effect on someone who is heavier, stronger, more stubborn etc etc. That said I still appreciate someone who is adrenalised who will not necessarily respond in the same way. GS: OK you know how much I respect you as one of my senior instructors, my favourite training partner and dog walking companion. One last question, do you think you can take me? JW: My brain says ‘no’. This is not just based on a feel, this is based on the fact you are in my opinion a fighting machine, trained & condition over many years. I may well be a tom–boy, but I’m not to that ‘gold’ standard. What I can say is it would be messy. I may not win, but I’d go down fighting. GS: I think that is why I hold you in the deepest respect. I think you would extract a great deal out of me so it would be a poor victory if we fought for real. We need to now explore how we can push the boundaries. You may be little but you always punch well above your weight. I think with the right circumstances and conditions you could wipe the floor with anyone, me included. So, for once, I think you are wrong, you have the attitude, the aggression and the ability. I know, I have the ability to drop bigger, better guys, been there and done it many times. That is why I know you, given the window of opportunity, can cream me if you get that sweet shot in. You may be little but you are determined. We need to work on some drills that take us further. You need to help me shape them. By the way we have a no holds barred fight owing 😉 Let’s see what you have. Soon. JW: Hummm now you mention it I did drop Lee (technical knockout apparently), doubled Pete over & made Bill see stars! I have made some great friends and learnt many things, not all self defence related, during the years spent training. I think a lot of women would benefit from just experiencing a tiny piece of what I/we as a club have experienced. There’s a lot they can learn and fun to be had alongside the calorie burning they desire.